4234 Jun 25 Postage stamps set 1948 / 50, all 20 values, fresh colors and in perfect condition mint never hinged Michel 300,- €. 4053 ⊙ 2I 6 Rp. Black / dark brownish red, vertical background, wonderful having bright colors and good margined outstanding quality with red Zurich rosette. Photo expertize Moser-Räz. 4073 ⊙ 2a 5 C. Black / red, the so-called \"Vaud\", fresh colors and on all sides good margins, left with cut lines, centric tied by rare black Genevan rosette, the only from 1.-17. 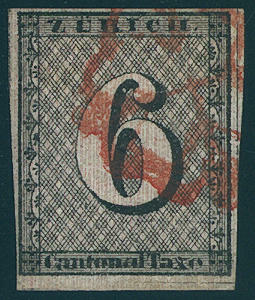 January 1851 was used. A rarity of this issue! Photo expertize \"genuine and immaculate\" Eichele / SBPV. 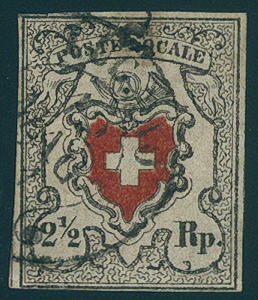 4074 ✉ 2a 5 C. Vaud, wonderful having bright colors, on all sides enormously piece in outstanding quality with enormous margins on very nice part of a fold letter with clean mounted black Federal lozenge and additional single circle postmark \"GENEVE 14. 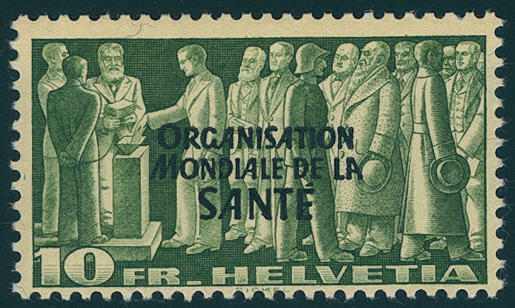 SEPT. 51. \" to Vernier. Photo expertize Rellstab BPP. 4075 ⊙ 5I 2 ½ Rp. 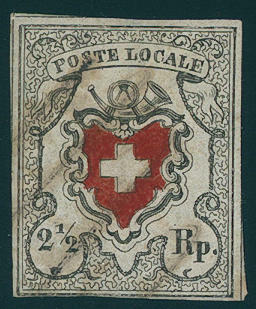 Poste Locale with framed cross, fresh colors, three sided with wide margins, at the bottom narrow margin with slightly and clean mounted lined lozenge from Yverdon, as far as in excellent condition, photo expertize from the Weid. SBK 2100,- Sfr. 4076 ⊙ 5Ia 2 ½ Rp. Local mail with framed cross, fresh colors and on all sides with very wide margins with almost complete cut lines, left crease, with rare handwritten cancellation, photo expertize Berra-Gautschy / International Association for Philatelie Experts. SBK 2300,- Sfr. 4077 ⊙ 5IIa 2 ½ Rp. Black / red, local mail without framed cross, type 28, wonderful fresh colors and on all sides perfect margins, three sided with cut lines with centered black Federal lozenge. An outstanding quality this sought-after issue! Photo expertize Eichele / SBPV. SBK 3800,- Sfr. 4078 ⊙ 5IIa 2 ½ Rp. 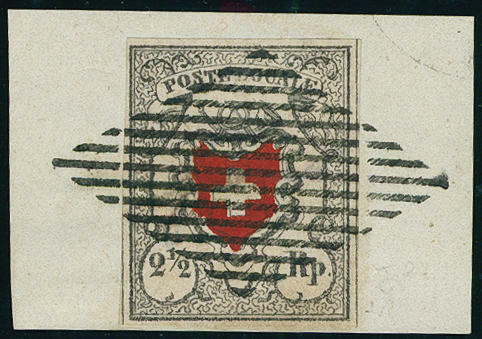 Black / red, local mail without framed cross, wonderful fresh colors, right above small marginal gap, otherwise excellent condition and on all sides good margins with rectangle cancel \"FRANCO\" from Basle. Photo expertize Kimmel / SBPV. SBK 3800,- Sfr. 4079 ⊙ 5IIa 2 ½ Rp. 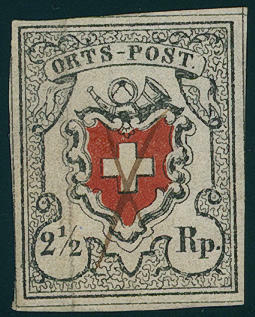 Local post without framed cross, fresh colors and good margins, upper margin corrected, with clean mounted black Federal lozenge. Photo expertize Eichele. SBK 3800,- Sfr. 4080 ⊙ 5IIa 2 ½ Rp. 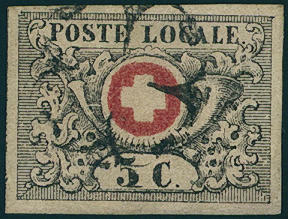 Local post without framed cross, fresh colors, margin left and above corrected, with clean mounted rectangle cancel \"FRANCO\" from Basle. A decorative copy! Photo expertize Eichele. Michel 2500,- €. 4081 ⊙ 6Ia 2 ½ Rp. Black / red, Poste Locale with framed cross, wonderful fresh colors and in perfect condition margins with especially nice centric and clear mounted Luzerner \"PP\". An outstanding quality for the highest standards! Photo expertize Eichele. 4082 ⊙ 6Ia 2 ½ Rp. 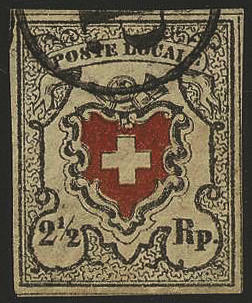 Black / red, Poste Locale with framed cross, horizontal pair, left close, otherwise good and wide margins, thin places, left stamp with marginal gap, two clean mounted \"PD\", a scarce and attractive unit, photo expertize Rellstab / SBPV. SBK 4600,- Sfr. 4083 ⊙ 6Ia 2 ½ Rp. Black / red, Poste Locale with framed cross, fresh colors, on all sides having full to wide margins with two ring cancel \"LOCARNO 12. Want. 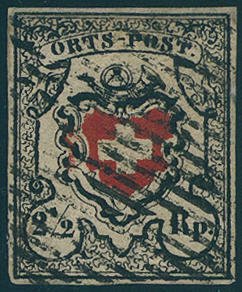 1851\", superb in every respect (choice copy). Photo expertize Eichele / SBPV. SBK 2100,- Sfr. 4084 ⊙ 6Ia 2 ½ Rp. 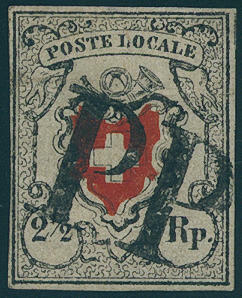 Poste Locale with framed cross, wonderful fresh colors and with wide margins, neat and clear cross free mounted stamp \"P. P. \" in the circle (AW no. 313) in perfect condition. Photo expertise Moser / International Association for Philatelie Experts. 4085 ⊙ 6Ia 2 ½ Rp. 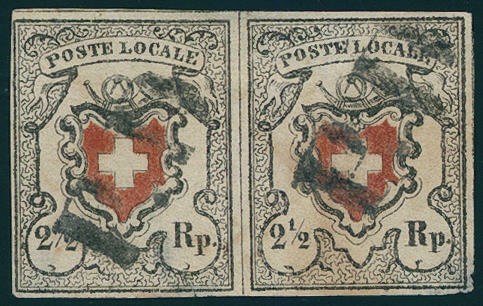 Poste Locale, horizontal pair wonderful fresh colors, small faults, clean mounted \"P. P. \" in the circle, an attractive and scarce unit, photo expertize Rellstab BPP. (Zst. No. 14 I). SBK 4600,- Sfr. 4086 ⊙ 6Ia 2 ½ Rp. Poste Locale with framed cross, fresh colors and good margins with centered Federal lozenge, superb in every respect (choice copy), expertized abbot BPP, photo expertize Eichele SBPV. SBK 2100.- Sfr. 4087 ∆ 6Ia 2 ½ Rp. Poste Locale, wonderful fresh colors, large margins all around with parts of the cut lines on magnificent white letter piece with perfect centered, pricked clear, all accurate mounted Federal lozenge. The Absolute ne plus ultra of this stamp for your highest requirements! Photo expertize \"excellent condition\" Alain von der Weid / SBPV. 4088 ✉ 6Ia 2 ½ Rp. Black / red, Poste Locale with framed cross, horizontal pair wonderful fresh colors with large right margin of sheet, above inconspicuous horizontal crease, on all sides good margins with very fine mounted clear lozenge and additional two ring cancel \"NEUVEVILLE 23.8.51. 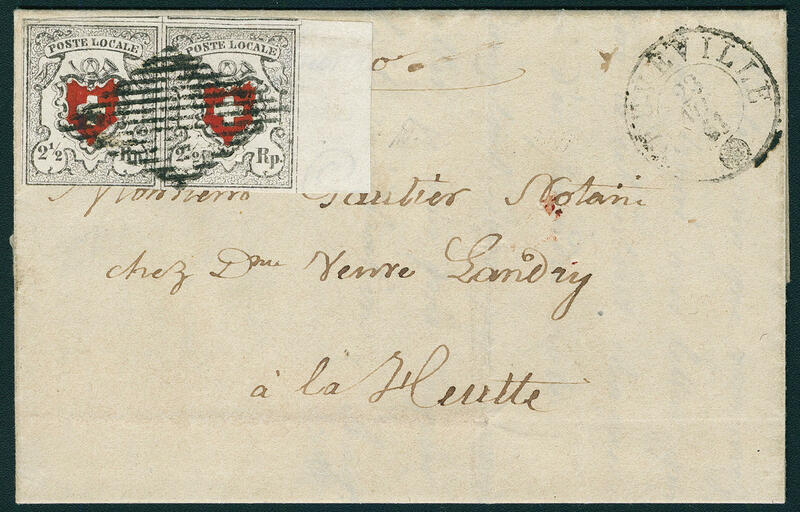 \" to La Heutte with on the back transit cancellation \"BIENNE\". 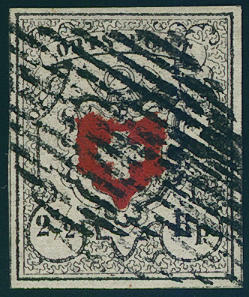 A very decorative and extremely rare franking, particularly since pairs with so wide margin copies nearly unknown are. Photo expertize Alain von der Weid / SBPV. 4089 ✉ 6Ia 2 ½ Rp. 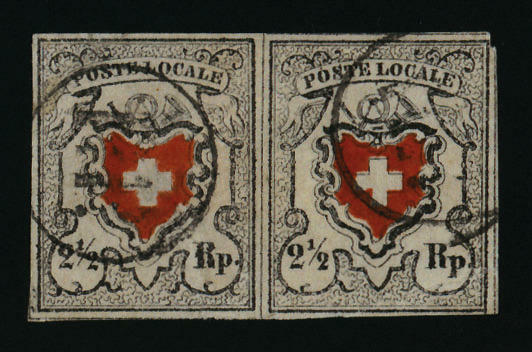 Black / red, Poste Locale with framed cross, two examples, fresh colors and on all sides excellent margins, only the left stamp left at the bottom cut, as scarce multiple franking on cover with two clean mounted clearly blue single circle postmark \"P. P. \" and additional blue two ring cancel \"NEUCHATEL 4. FEVR. 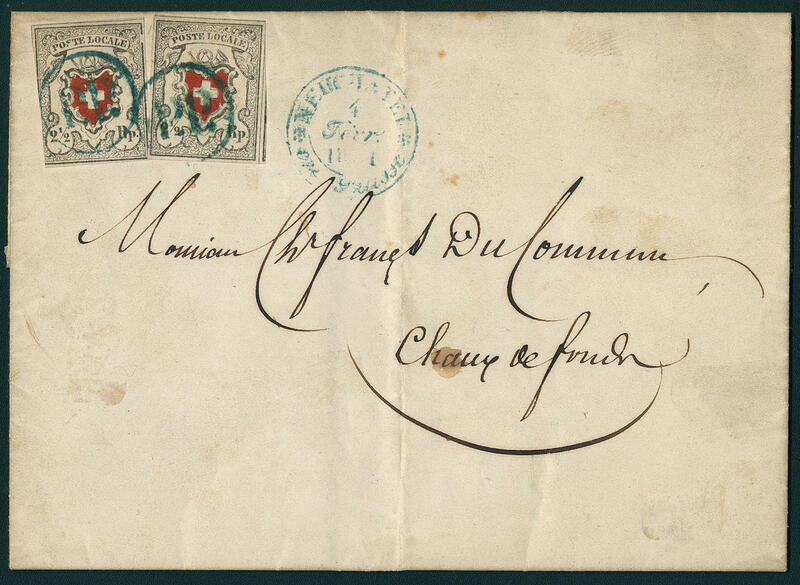 1851\" to Chaux de Fonds with arrival postmark. The left stamp with plate flaw \"interrupted frame line right above and S from POSTE complete printed out\" (Zumstein no. 14 I. 2.05. ). A very attractive and rare cover! Photo expertize Hermann / SBPV. 4090 ✉ 6Ia,9II 2 ½ Rp. 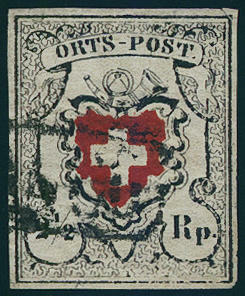 Poste Locale with framed cross, on all sides good to wide margins, left margin line touched, in very rare mixed franking with 5 Rp. 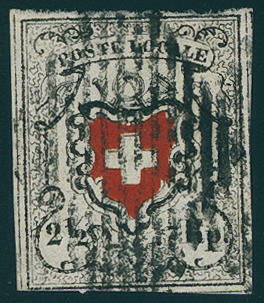 Pale blue / red, fresh colors and good margins on small-format cover with two clearly black confederate lozenges and red posting stamp \"St. Gallen 16. 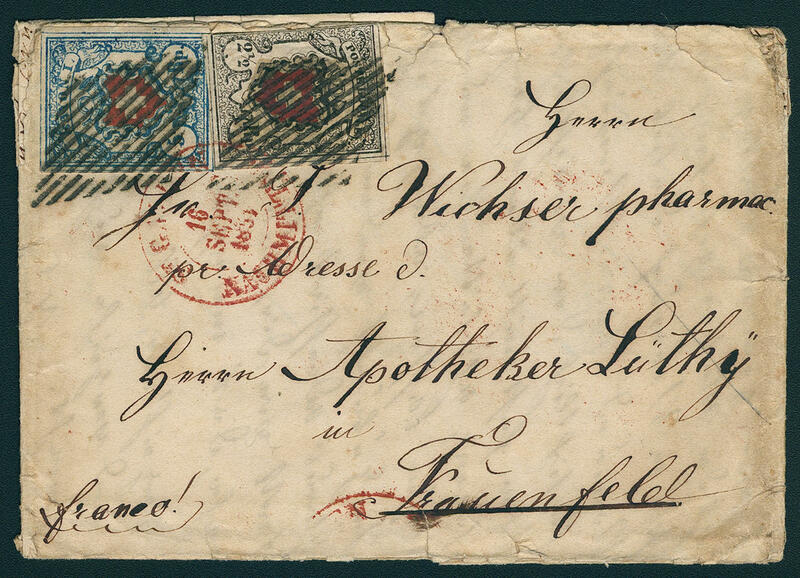 SEPT. 1851\" to Frauenfeld, letter edges here and there a little fringed. 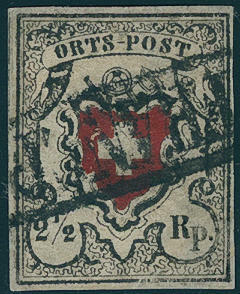 An extraordinarily scarce mixed franking! Photo expertize Eichele / SBPV. SBK 9500,- Sfr.